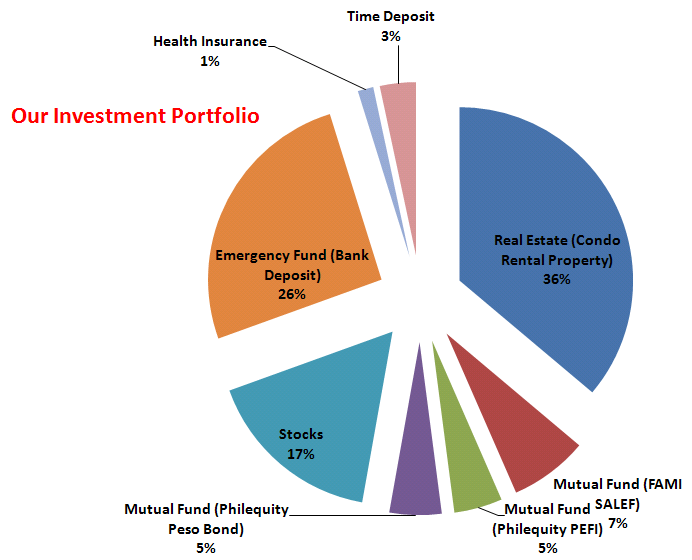 In investment, diversification plays a very important role. I have blogged this topic last time, but now I want to walk the talk and challenged ourselves to do it even better. Diversification means investing in various investment vehicles to minimize the risk of losses. We are currently on a bull run market, our economy is growing significantly. However, this is not forever. Putting all your money in one basket full of equities is not a good idea. 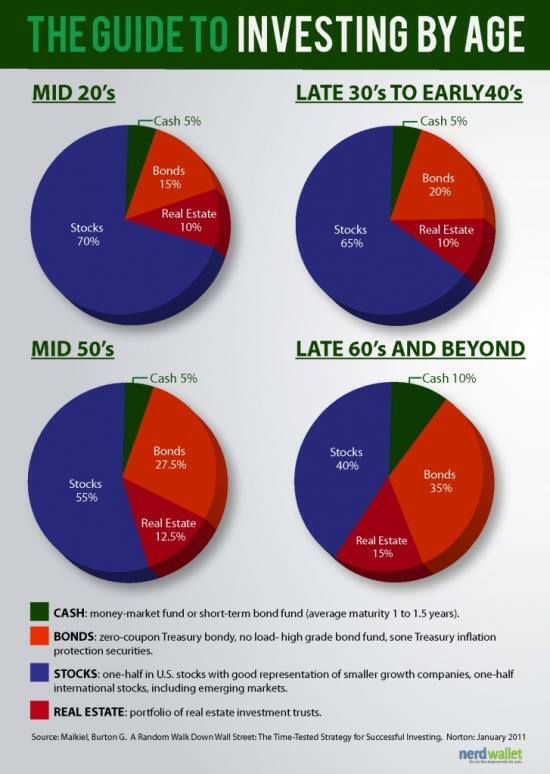 Below graph shows a sample diversification investment portfolio with corresponding age bracket. While there is no universal formula about it, you can use this as base guide to your investment. Me and my wife are managing both our finances individually. I know for some couples, they tend to merge their assets and incomes and it work best for them. However, in our case, we practice managing our own portfolio. But we have a joint account savings for our emergency fund that we can use in the future. As of this posting, below is my investment portfolio. 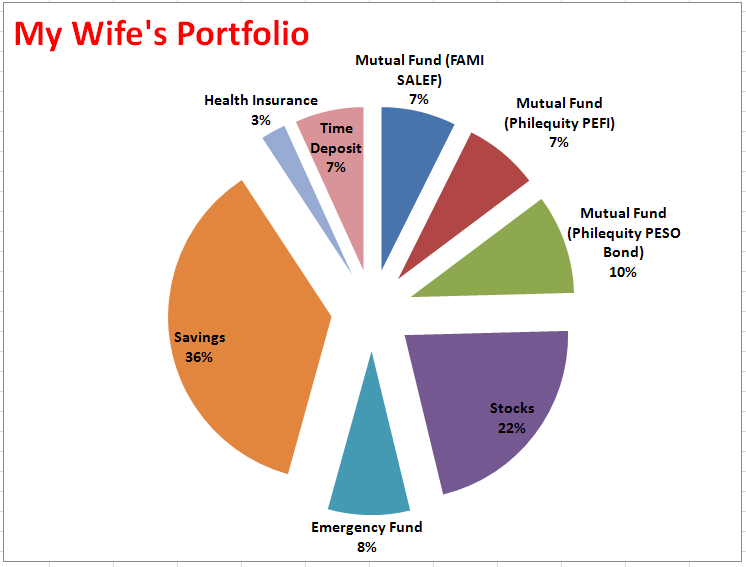 On the other hand, here’s my wife’s portfolio. Given the base portfolio, I know we still have a lots of things to adjust on it. Obviously my wife is still have some extra cash that we want to convert in real estate and UITF investment soon. Then comes the non life insurance to protect our asset with any life circumstances. Before the year ends, we’ll get for both of us. 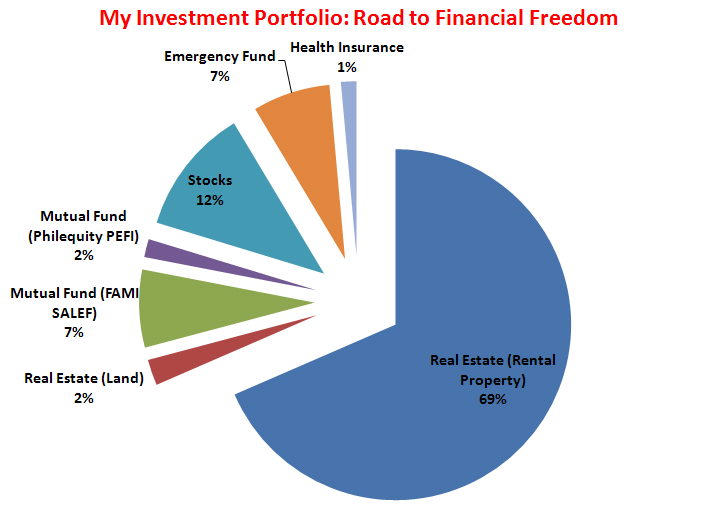 This investment portfolio will be our guide to achieve financial freedom. We are looking forward to retire at age 40 and enjoy the rest of our lives with our family. Try to create your own and diversify. This is a blueprint to success, make it happen. Hi my name is Richard. I am a Registered Financial Services Consultant in Singapore. If you have any queries or you need help on your insurance policies and investment linked products, feel free to message me :-) We can have a cup of coffee while I do financial review and give advice with regards to your finances :-) Contact me thru email rlmacalintal(at)yahoo.com or SMS me +65 82235186. Disclosure: I am a Financial Consultant of AIA. The statements or opinions expressed on this site are my own and do not necessarily represent those of AIA. Next: How Much Do You Need for Your Child’s Education? Have you found renters for the property yet? I remembered you blogged about buying that. hi carlos. yes, it is occupied a month ago pa. its a very good passive income source. almost every week i got queries for tenants asking if it is available. that’s how good the location is. we are looking forward for another unit by next year to divert some of our investments into real estate.